In a pleasant gesture of goodwill, Pakistan has accorded the status of Holy City to Nankana Sahib - the birthplace of the first Sikh Guru Nanak Dev. 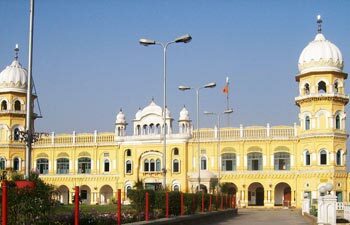 Nankana Sahib is one of the most revered pilgrimage destinations for the Sikhs in India and other parts of the world. The declaration about granting the status to the holy shrine was made by Pakistan Interior Minister, Rehman Malik. Malik made this announcement recently at a dinner hosted to the delegation of Indian lawyers comprising bar representatives at a hotel in Islamabad. These lawyers had visited Pakistan to attend an international conference of lawyers convened by the Supreme Court Bar Association of Pakistan. Malik said that the decision by the government of Pakistan was a gesture of goodwill towards the Sikhs of India and the community settled in other parts of the world. The decision came in the wake of the demand by the community to give holy city status for the historic place where Sikh shrine in the memory of Guru Nanak Dev is located. He further said that Indian citizens, who come to Pakistan, could visit Nankana Sahib irrespective of type of visa held by them. He said that persons having visa to visit any city in Pakistan can visit Nankana Sahib even without visa for this city. Rakesh Shahi, a senior lawyer, returning from the visit to Pakistan said that Parveen Parakh, president, Supreme Court Bar Association, had demanded the Pakistan government to grant one year visa to Indian lawyers. However, Rehman Malik announced that Indian lawyers could submit their visa documents verified by their respective state bar associations and they would be entitled to a five-year visa. He said that all bar members from India could get one year multiple visas to Pakistan. They would not need to register with the police stations in Pakistan. He added that all pilgrims visiting Nankana Sahib would be exempted from police registration in future. Dalbir Singh Pheruman, president, Punjab Haryana High Court Bar Association, said that lawyers across the border could work together to strengthening relations between the two countries. He sought the Pakistan government's help to work out the possibility of an open policy exempting the conditions of issuing visas to certain cities. A similar move could be initiated by the government in India. The participants from India said that Yasin Azad, president of Pakistan Supreme Court Bar Association, sought that two burning issues between both the countries should be settled for better relations. However, he did not name terrorism and Kashmir while mentioning the issues.